Nick first raised his pink umbrella back in 2010 as a Tour Guide for Savor Seattle leading dozens of groups around Pike Place Market each week, impressing upon them not only the best food-finds, but the legends and lore of the Market. 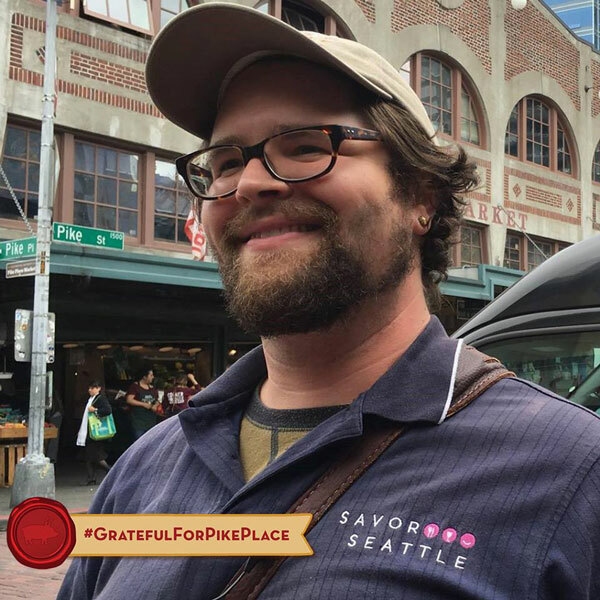 He quickly rose to the ranks of lead tour guide and tour guide manager and has since made it a priority to impress upon his understudies the importance of community that is core to the values of Pike Place Market. We’d say he’s also owning his own chapter in Market history. In just eight years he’s acquired numerous other leadership roles around the Market: Friends of the Market Board Member, Pike Place Market Constituency Member, Co-creator of Portrait of the Market Photo Tour & Symposium, Market Trivia Host and Care for the Market Luncheon Speaker – just to name a few. “The more you put into the Market, the more you get out of it,” said Nick. Nick, we’re #grateful for everything YOU put into the Market!